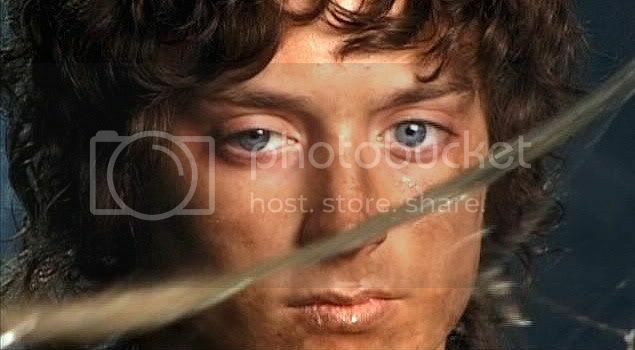 Last "Limited Edition" LotR DVD screencaps. Honestly. Below are a mere dozen caps, but I saved them for last because they are so beautiful. In this bit of the RotK "Limited Edition" Extras, Elijah is merely standing around the Shelob's Lair set -- somewhat in character, mostly out -- while crew members fiddle about with this before continuing. The frames taken from this moment are, to me, absolutely exquisite. 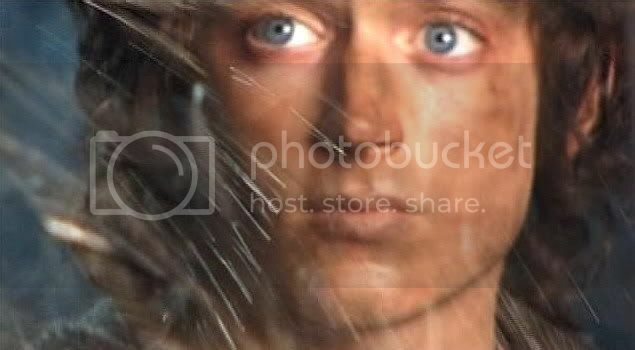 You know how the face of Elijah Wood as Frodo affects me: the aesthetic power of its classical beauty: a face straight out of the history of painting. These caps exemplify that quality to a very high degree: every frame a work of art, portraits of what pearlette calls a "Baroque angel". 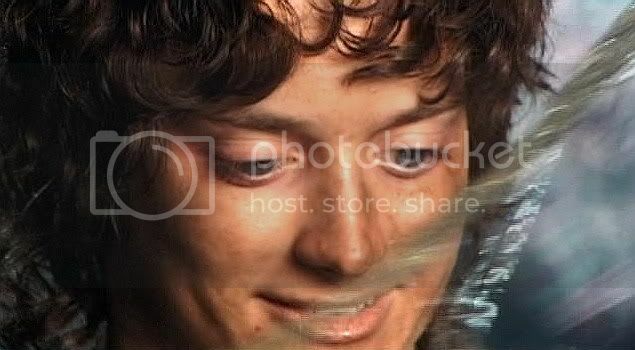 I also think that the shreds of spiderweb that partially obscure Frodo's face from view add a wonderful effect. They make a veil, almost, stretched across the image of his face. 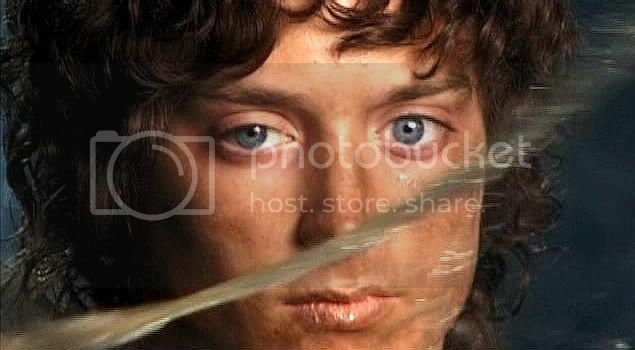 A veil which only accentuates the sense of mystery and near-other-worldliness many of us see in film-Frodo. 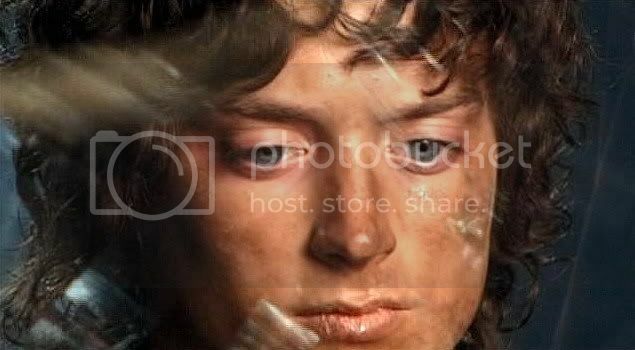 We see Frodo plainly; as he is, but we also see him through the scrims of our imaginations. Stealing from a famous text, we see him "dimly", but, one day, we hope, if only in our imaginations, "face to face" -- as his creator, Tolkien saw him. Whether fully-revealed or veiled, his face takes my breath away. Once again, many thanks to jan-u-wine for loaning me these DVD's. Note: As usual, these have been tweaked for brightness but especially for sharpness. The top images were the most blurry, but so beautiful! You can try sharpening them more, but the surface of the image begins to look like cheesecloth or windowscreen. If that is an effect you like, go to it! This is to let fans of these images know that wendylady1 has just made some really striking versions of one of the last screencaps in the series, using a photo-shopping program. The effects are subtle so that they don't destroy the original image, but bring out moods and nuances in different ways. If you would like to see Wendy's enigmatic caps, go HERE. Another of my artist-Frodo-friends (and current chief beta of "Threshold"), stillscarlet, has also photoshopped one of these images. I had a huge weakness for an Elijah she had done a while back, as if behind a scrim of lace. It made me think of him looking wistfully out of a window (see image I am referring to in a comment below). So, acquiesing to my wishes, she made a few lace ones of one of the Shelob's Lair cap, also ones using gorgeous "oil painting" and "tree bark" effects. To see Scarlet's screencap versions, go HERE. P.S. 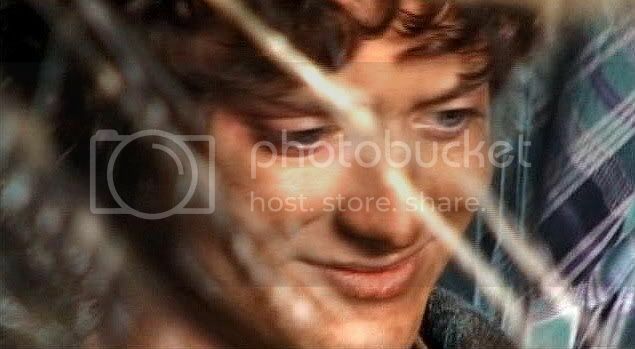 There's a great little sequence in which Andy Serkis, off-camera, helps spur Elijah's reactions by delivering some of Gollum's most taunting lines while Frodo is hung suspended in the web. So that's where that look of blazing fury came from! Unfortunately, it didn't really make good caps. But, again, it was an example of a generous artist: an actor who made it his business to bring the most out of his fellow-performers with his enthusiastic engagement, even though he was not on-screen himself. 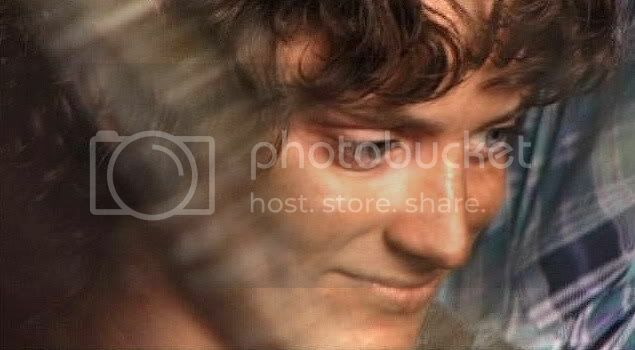 Listing of all Frodo and Elijah screencaps HERE. 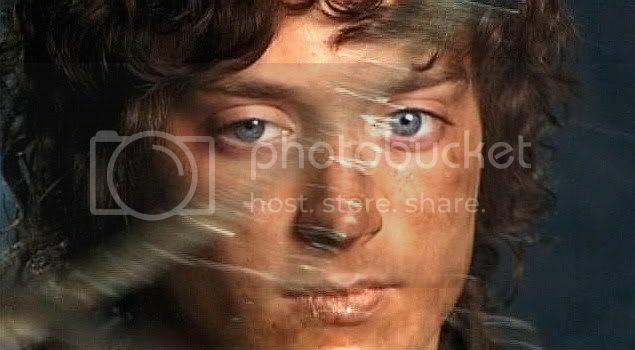 One of my Tolkien-friends has done some effects to one of the mesmerizing screencaps at the end. I am asking her if I can link them. If/when she says yes, I'll send you a comment. The effects give the images a variety of subtly different, very cool looks. I love seeing this 'behind the scenes' Frodo/Elijah. Thank you again. Your 'Limited Edition' LotR screencaps has been a wonderful ride, Mech! Particularly these two last entries are very beautifull and enligthening of the acting process. I'm such a enthusiast of the movie "making of" that sometimes I enjoy them more than some films. What is region 1 and 2? Does that apply for DVD's, not just videos??? Dang! There are so many films I've wanted to buy off Ebay that were available in video but only Region 2. I thought the DVD's would be different. Boo hoo hoo! These were, perhaps, my favourite images of Frolijah I've ever seen, Estelanui. The bottom series, especially .... I think they are mesmerizing. *sigh* I love him. Love him, love him, love him! Did I mention that I love him? He's just glorious. Thanks so much for these again. You are welcome, Primula. I'm glad to know I'm not the only one who could stare at him for hours. Thank you for this wonderful series of screencaps! Frodo really is just made for this isn't he ?!! Hi, Wendy, I just got back from errands and saw your post right away. I left you a message there, asking if I can add a link to this entry. They came out so magically. I loved looking at all the effects you got. Yes, these are fabulous caps. Sorry they weren't sharper; I actually sharpened them as much as I could without making the surface look like cheesecloth. I think these may have become my favourite caps, for sheer art swoon-appeal. Aren't they the most GORGEOUS things????? Did you see Wendy's photoshops of one of them? I added a link above. Oh my gosh.. look at that. These are time machines. Sit down and look at them and then look up again. It will be hours later. Taerie, aren't they the best? I think these are my new all-time favourites. I just added a link up there to some photo-shops Wendy just did of one of them. They came out reeeeeeallly neat! There is something about beauty. I wish I could be more clear, but it's something about the aesthetic experience raising us up out of our everyday wordly mundane thoughts, and making us think about God more, about the 'higher things', more -- and/or more deeply. I've read the prayers of Soren Kierkegaard, and the prayers are mostly an 'ecstatic' outpouring to God, prayers of thanks, of awareness of God's glory (fully evident in all the beauty we see around us, in all forms...), and I like reading his prayers because I can relate to how he (SK) feels... wanting to express the inexpressible to God. And seeing Elijah, in beautiful shots such as these (THANK YOU MECH!!.. and WENDY,too!)... 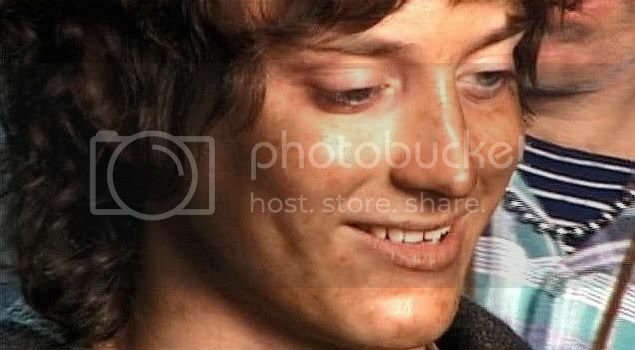 especially as Frodo.. makes me feel that same need to burst out with praise for God. It's really quite hard to explain. But intense beauty simply lifts spirits up, I believe. It surely raises MY spirits. For which I thank God. Thank you again Mech for all the work you have done on the screencaps. I know they are a 'labor of love,' but even labors of love take TIME. And time is very dear. Must run. Goodness, such perfection in one human being. He really does look like the Baroque Angel that you have all been referring to. He is out of this world, with one foot in the next world. Wow, Mary! What paean of praise! I know what you mean about this face making one want to pour it out (praise, that is). His face is sort of the Annapurna or Grand Canyon or Northern Lights of faces. To my aesthetic tastes, it's the tops. Faces don't get any more gorgeous. Funny, that he's a man. I know a lot of readers might think that's an odd remark, especially if they are slashers, but I spent my girlhood (3-10 years old?) drawing a lot, and I always drew what I thought most beautiful: women and horses. Never men. I drew a lot of angels, true, but I always thought angels were female. I was shocked when a lady at Sunday School told me all angels were men. Whaaaah...???? Not only did I not like the idea of my own gender being shut out of angel-hood, but men were boring-looking and un-beautiful. In Frolijah, I think God has finally satisfied my aesthetic cravings in one person. He's as strong, well-shaped, valiant and sturdy as a horse, but as beautiful as a woman, in terms of delicacy of line and colour, and silky textures. Oh, what a dream come true! When I look at these gorgeous caps I don't see Elijah Wood, I see Frodo. Its so strange to me how they are like seperate entities, not the same. 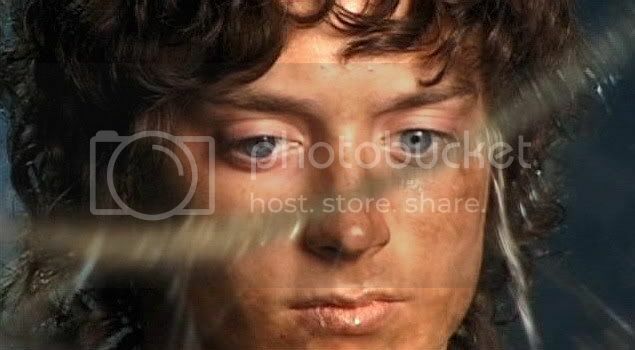 Elijah is beautiful but there is something about "Frodo" that is so mesmerizing..and so ethereal. Gordon Bennett on a bicycle! Mechtild, these are beautiful! I'm just speechless! You are welcome, Starlit. They are splendid. Thank you Film Gods for letting these films be made and for guiding EW to play Frodo! I really don't know what to say. The beauty of those os almost unbelievable. And it's just some outtake thing from inbetween repeat scene shots! Each does look like the artwork of one of the great masters. Thank you so much for the screencaps series you've given us, Mech. 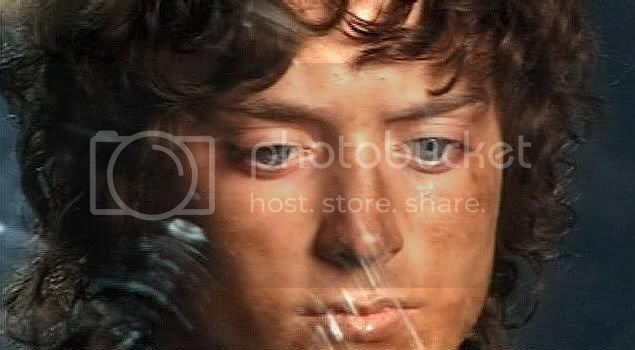 It's been a real and wonderful treat and it has refreshed my LotR / Frolijah awe....something I wasn't at all sure could be done anymore, to tell the truth. The beauty of those os almost unbelievable. And it's just some outtake thing from inbetween repeat scene shots! Each does look like the artwork of one of the great masters. Yep, yep, yep. Sure enough. *smooches* to you and welcome back to the nuts, even if just for a visit. What more can I say, save that he is the most marvelous creature ever and that you are a truly sweetheart? I agree - "marvel"-ous. He is. What a perfect meeting of live person and fictional character on film. There's no doubt about it he/they are a stunner/stunners. A well-put comment, Frodosweetuff. One that leads to pleasant, lengthy reflection.